Two large works of art face off each other at the Barakat Seoul, sharing the common subject of the death of a father. However, the two pieces, part of “The Absence of Paterfamilias” exhibition, are dissimilar in almost every other way. “The Dinner,” an animation loop by Belgian artist Alex Verhaest, is calm on the surface, but the tension among the characters is clearly palpable. The figures seem void, yet full of angst, their empty gazes looking out in different directions. The characters keep their hands to themselves or on the table in front of them. 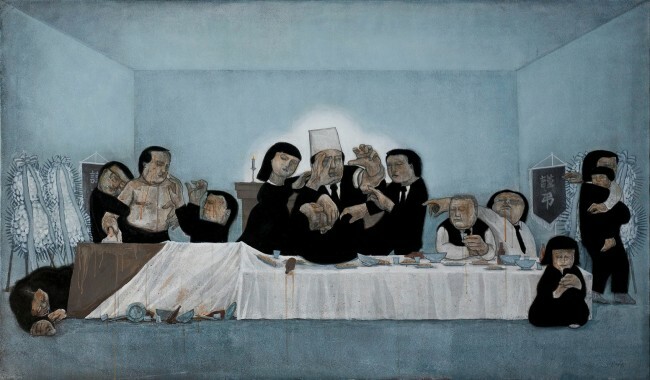 Unlike Verhaest’s “The Dinner,” where there is no physical interaction at all among the characters dealing with the suicide of their father, Korean artist Cho Moon-ki’s “The House of Mourning” is full of hyperbolic physical action. Family members are engaged in physical violence, quite possibly over inheritance. The narrative painting is quite the opposite of the enigmatic “The Dinner,” which begs you to pick up the phone placed in front of it and call up the family. And when you do, you eavesdrop on the family’s conversation, marked by much passive-aggressiveness. Although the two works of art share a common theme, their starting points are very different. “I wanted to examine why conflicts arise among people and I narrowed it down to conflict among family members,” said Cho during a conversation with Verhaest at the Barakat Seoul in Samcheong-dong on May 30. “I think social ills originate in patriarchal family structure. I sought to express this picture of our society in exaggerated form using a common story, our story,” he said. Verhaest, on the other hand, investigates communication problems posed by technology in “The Dinner,” a work that is aesthetically influenced by late Medieval and early Renaissance art. According to Verhaest, painters of those periods used lenses, a form of technology, which resulted in outlandish imagery. 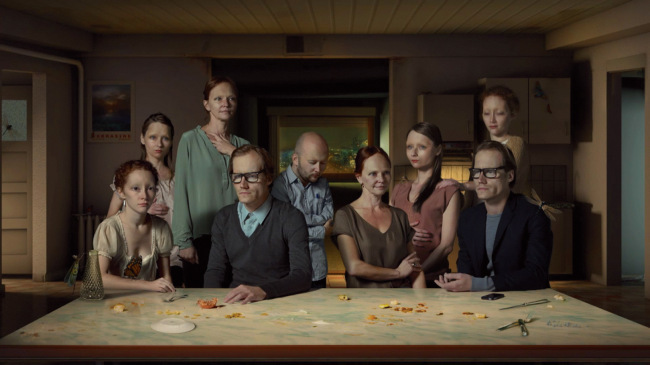 “This is similar to what is happening with ICT (information and communication technology).” Verhaest herself deliberately distorted the faces in “The Dinner” after the manner of the late Medieval and early Renaissance art, resulting in a Pixar-like mood. Both “The Dinner” and “The House of Mourning” feature a smartphone -- on the table, and in the hands of a girl, respectively. “Phone is a signifier of hiding one’s face, indulging a very human part of not wanting to communicate,” said Verhaest. Cho, whose painting shows a girl with eyes glued to the phone screen, oblivious to the violence around her, noted that technology does impede communication. Yet, he emphasized the role phones have in facilitating communication, pointing out that new technologies create new families who can be of comfort to each other. “You don’t use it (phone) when you don’t want to communicate with family,” he said. This aggressiveness is acted out in Cho’s painting. “It is not possible to cut family ties, so fights are inevitable. If it were possible to divorce each other, fights might not occur. It makes me wonder how the work might have come out under (a) different social environment,” Cho said. Another similarity the two artists share is the use of religious iconography and religious references. “The western painting tradition was sponsored by the Church,” said Verhaest. “Temps Mort/Idle Times,” composed of “The Dinner,” “Character Studies” and “Table Props,” was influenced by ars moriendi, a guide to help people die in Godly fashion that was published in the past, Verhaest explained. The five temptations that beset a dying man -- lack of faith, despair, impatience, spiritual pride and avarice -- are represented by the five characters of the “Character Studies,” for example. The butterflies and the dragonflies in “Table Props” represent the devils and angels that hovered around the dying men depicted in the 15th-century ars moriendi woodcuts. References to Hieronymus Bosch, the still lifes of Pieter Claesz and the distorted faces of Mattias Grunewald combined with modern animation create the unique, otherworldly atmosphere of Verhaest’s works. “My work is about (the) staging of mourning. The difference between what is said and felt,” Verhaest said. For Cho, his appropriation of religious symbols is motivated by the similarities he perceives between religion and the Confucian family relations in which the family is held sacred. “I am focused on creating misunderstandings. Religion is often used to control people for political ends,” Cho said. A recurring theme in Cho’s works is the problems that arise between people. Using thematic devices that cause misunderstandings, Cho attempts to show that communication problems, which arise from misunderstandings, can also lead to conflicts. “For me, the problems that arise between people is the most important theme,” he said. 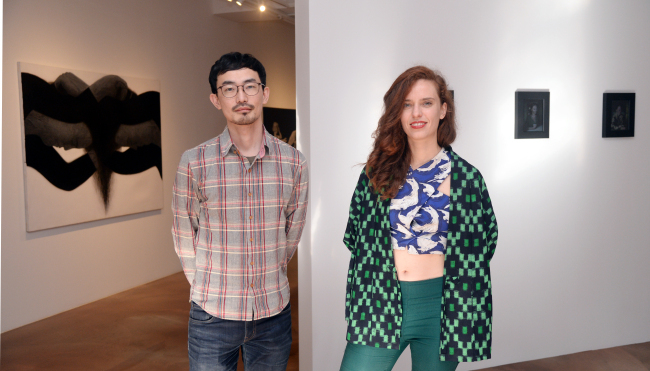 “The Absence of Paterfamilias” runs through Aug. 6 at Barakat Seoul in Samcheong-dong.